This was quite an interesting wine. 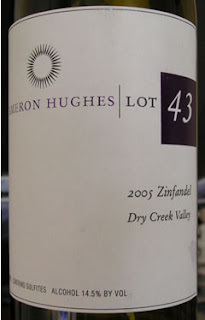 According to Cameron Hughes' website, its composition is 80% Zinfandel, 15% Syrah and 5% Petite Sirah. While it cost me $12 from the "winery," many Costco locations in California carry it for two bucks less. I split the bottle into four servings, three into 187.5 ml bottles for subsequent nights, and the first quarter for the first night. Night one: Very muted aromas that took a very long time to open up but when they did, there was a lot going on: Earthy, white pepper, plum, peach pit, sandbox sand and some smoky spice mixed with mocha. Complex but not very forthcoming - the aromas didn't come wafting out of the glass, they waited to be sniffed out. The wine was more open on the palate. Gravelly red fruit, plums and some pepper that turned more and more lush, jammy and viscous with air. There was an initial tannic bite that mellowed out over time, too. There's 14.5% alcohol content but the "heat" is well covered by the abundant flavors. The three 187.5 ml portions over the subsequent nights were all pretty much the same although the aromas didn't open up as much as the 1st night's tasting. Two thumbs up on this one; great QPR at $12 but even better if you snag it at Costco. My only complaint is that the aromas were pretty shy. Give this wine lots of air time and it makes for a good drink now. Here's the Youtube music video that I thought matches with the wine. If you can't see it below, then click here.